It’s never too late to get started at Hope! Whether you’re a first-time college student or transferring from another school, we’re eager to welcome you to campus on Saturday, January 5, 2019. Our January Orientation is a one-day experience designed to provide all the details you need to successfully transition to Hope. Our Student Development office will open at 9 a.m. so that you can pick up housing keys and access codes. You will have all morning to move into your space, visit Campus Safety for ID cards and parking passes, and to purchase books at the Hope bookstore. We will meet you at 1 p.m. in the Bultman Student Center Great Room. Along with dessert and coffee, there will be representatives from various campus offices including Student Life, the Health Center, Computing and Information Technology, and Counseling and Psychological Services. From 1:30–4 p.m., students will have the opportunity to take a campus tour, track their degree with the Registrar's office, and meet in small groups with current students. At the same time, parents and families will have sessions with current Hope parents, Boerigter Center for Calling and Career, and the Dean of Academic Advising. The remainder of the weekend is yours, as you settle into your new home away from home. 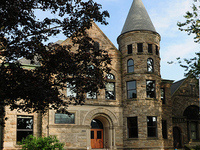 Hope College has more than 60 student organizations available for students to participate in.